Take a look at this page covering some of the most important developments in InfraTec's company history. In keeping with the motto "entirely in the family" and in best summer weather, the InfraTec GmbH Infrarot und Messtechnik celebrated its 25th anniversary. With the introduction of the ImageIR® 10300, the Infrared Measurement Division is further expanding its leading position as one of the world's leading suppliers of thermography systems. The camera detector with its (1,920 × 1,536) IR pixels offers users from industry and science the highest geometrical resolution for a radiometric calibrated thermal imaging camera with cooled detector and, for the first time, enables images to be taken in Full HD format. After three years of research and development work, the joint project "Fast Infrared Spectrometer for the Analysis of Hydrocarbons" (SIRKO) ends in February. The result, the XFP-3137, supports InfraTec's technological leadership in integrating tunable micromechanical Fabry-Pérot filters (µFPF). The Sensor Division is presenting the first miniaturized four-channel detector for gas and flame sensors as a further new development. With its stack design, the LRM-254 embodies a completely new concept that will allow more channels to be integrated in the future without changing the housing size. The models of the thermal imaging camera series ImageIR® produced at the Dresden site can now be equipped with a 10 GigE interface. Users can better exploit large detector formats in full frame mode because images are transmitted with significantly higher frequencies. InfraTec continues to expand its presence in the USA. Since summer, InfraTec infrared LLC has also been coordinating the sales of thermography systems. The infrared sensor technology division was linked to all European customers via a direct distribution channel starting in January. InfraTec presents a new generation of detectors with integrated tunable Fabry-Pérot filter for the first time, with integrated control implemented by an ASIC and an EPROM. The infrared detectors LMM-274 and LIM-272 are presented the first time. In the infrared measurement department, the first thermal imaging cameras with super zoom lens and HD resolution, ImageIR® 8300 / 9300 Z are placed on the market. The camera series VarioCAM® High Definition is introduced as part of the mobile equipment lines "research" and "inspect" and the stationary version "head". Those cameras are also equipped with other new features such as the "permanent autofocus" and the unique "EverSharp function". The EU-funded project ESiP, where InfraTec also plays a major role, is awarded the ENIAC Innovation Award. InfraTec is also involved in the EU project "ThermoBot" - development of an autonomous robotic system for thermographic crack detection. The high-speed thermal imager ImageIR® 8300 high performance allows frame rates of 350 Hz for the first time. Thermographic cameras with detectors of the next generation in Megapixel format VarioCAM® High Definition with (1,024 x 768) IR pixels and ImageIR® 9300 (1,280 x 1,024) IR pixels are launched. The thermography day "Research & Development" with participation of numerous internal and external speakers in the head office Dresden takes place for the first time. The new product catalog with lots of additional information on the topic of infrared sensors is available. Together with 260 business partners, customers and personnel InfraTec GmbH celebrated its 20th company anniversary on the 1st of July 2011. InfraTec participates in the international projects of "Resource-efficient and sustainable production of quality steels with improved on-line process control of the vacuum degassing" and the project of "Turbo Production for Aircraft – automation technology for aircraft". The Fabry-Pérot detector by InfraTec wins the SENSORS EXPO "Best of Show" Gold Award. The sensor division receives the Prism Award for Photonics Innovation in the category "Detectors, Sensing, and Imaging Systems" at PHOTONICS WEST for the "MEMS tuneable Fabry-Pérot Interferometer for Infrared Absorption Spectroscopy". The thermographic software IRBIS® 3 was test winner in a comparison test of various thermographic software products. Introduction of the second generation of high-end camera series ImageIR®, supply of the wordwide first fully automated infrared system for spot weld testing. Introduction of the newly developed thermographic software family IRBIS® 3, major order for the delivery of 300 VarioVIEW-thermographic systems. Supply of an infrared test system for non-destructive weld seam testing. The sensor division together with Technical University Chemnitz - ZMT and Fraunhofer IZM Chemnitz receives the SENSOR innovation award for 2008 from the AMA professional association for sensor technology. Awarded is the "MEMS tuneable Fabry-Pérot Interferometer for Infrared Absorption Spectroscopy". The subsidiary InfraTec - Infrared Sensor and Measurement Technology Ltd. is founded in Great Britain to care for customers of the sensor division. New active thermographic system PV-LIT for photovoltaics applications. Foundation of a subsidiary in the USA. Market launch of the wordwide first mobile microbolometer camera with Mega-Pixel resolution, namely VarioCAM® high resolution. Foundations of subsidiaries in Great Britain and France. The size of staff exceeds 80. The Sensor Division introduces two new product series of highly innovative detectors to the market. Within the framework of a long-term contract, InfraTec becomes the worldwide exclusive (except Northern America and Japan) representative of the thermography system manufacturer JENOPTIK Laser, Optik, Systeme GmbH. An increasing turnover in both divisions requires to additionally hire qualified labour. For improving its presence in the Polish thermography market, InfraTec founds a subsidiary there. The number of staff exceeds 50. InfraTec supplies automated thermography solutions overseas. Orders received by the Sensor Division from all over the world require substantial extension of the manufacturing capacity. Staff and their families and numerous domestic and foreign business partners jointly celebrate the company’s 10th anniversary on an Elbe-river steamer. Sensor engineering production moves into its own additional manufacturing building. Activities regarding multicolour detectors, preferably for gas sensor technology, are bundled under the trademark PYROMID®. InfraTec offers closed solutions for digital real-time thermography, including security applications. The turnover in pyroelectrical detectors abroad exceeds the domestic turnover for the first time. The first products of a thermography software family are developed under the trademark IRBIS®. Thermally compensated miniature detectors supplement the product range. Acceptance of the exclusive representation of JENOPTIK thermography systems in Germany. Laser Components Inc. (USA) and Laser Components Ltd. (GB) start actively selling InfraTec detectors. Supply of the first automated thermographic system for early fire detection. The Sensor Division has a complete range of pyroelectrical detectors for modern system concepts as well as a replacement for standard products. Participation of the Infrared Measurement Division in the INTERKAMA, a major international measuring technology fair, in order to start worldwide sales of the company’s own thermography-automation solutions. 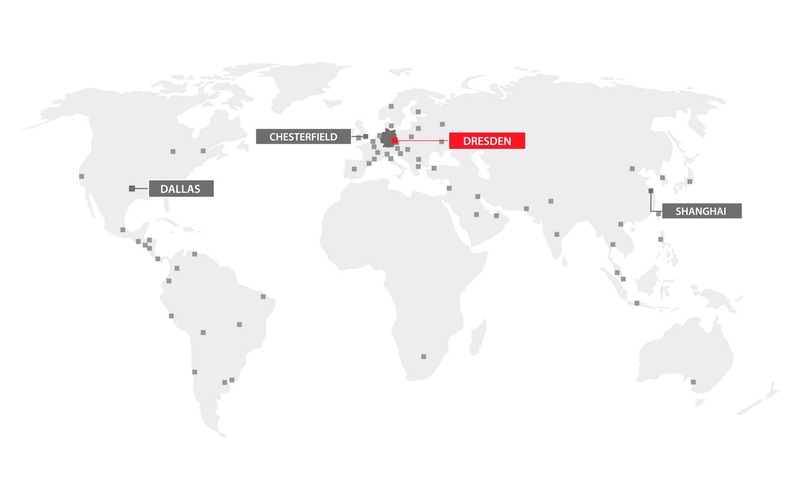 The Infrared Measurement Division expands its scope of products and becomes active all over Germany. Relocation to larger business premises at the new location of TechnologieZentrumDresden, Gostritzer Straße. Setup of a small complete manufacturing line for pyroelectrical detectors. Participation in the model test of "Technology-oriented Business Foundation in the New Federal Sates" as good support in developing an efficient technology for the microelectronic manufacture of infrared detectors. Laser Components GmbH, a company in Munich, starts selling InfraTec detectors. After its foundation in February, the company InfraTec GmbH Infrarotsensorik und Messtechnik is entered into the Dresden Trade Register on 24th of June. Start of business activities, preliminarily on premises rented from the Dresden University of Technology and immediatly after that at the location of TechnologieZentrumDresden in Bergstraße. Compact multicolour detectors of 2 to 4 spectral channels for gas analysis to enter the sensor market available for supply. Foundation of the engineering office InfraTech GbR (partnership) by Dr.-Ing. Heinze and Dr.-Ing. Krauß; preparations for founding a GmbH (limited liability company); the first supplier contract for pyroelectrical detectors is concluded.